Capturing carbon dioxide (CO2) is the first step in carbon capture and storage (CCS), a suite of technologies that prevents large quantities of CO2 from being released into the atmosphere. Carbon capture can be applied to large-scale emissions processes, including coal and gas-fired power generation, natural gas processing and fertiliser production, as well as the manufacture of industrial materials such as cement, iron and steel and pulp and paper. The application of carbon capture technologies to these processes can play a key role in reducing the world’s greenhouse gas emissions. 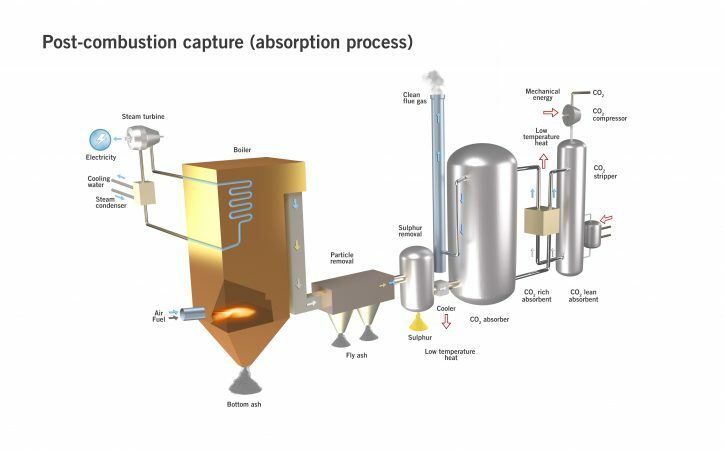 Carbon separation/capture technologies have been operational at large-scale in the natural gas and fertiliser industries for decades and have recently become operational in the power sector. Energy from fossil fuels such as coal, oil and natural gas is released in the combustion (burning) and conversion process, which also results in the emission of CO2 as a by-product. In systems where the coal is pulverised to a powder, which makes up the vast majority of coal-based power plants through North America, Europe and China, the CO2 must be separated at diluted concentrations from the balance of the combustion flue gases. In other systems, such as coal gasification (where coal is converted to chemicals, natural gas or liquids), the CO2 can be more easily separated. There are three basic types of CO2 capture: pre-combustion, post-combustion and oxyfuel with post-combustion. 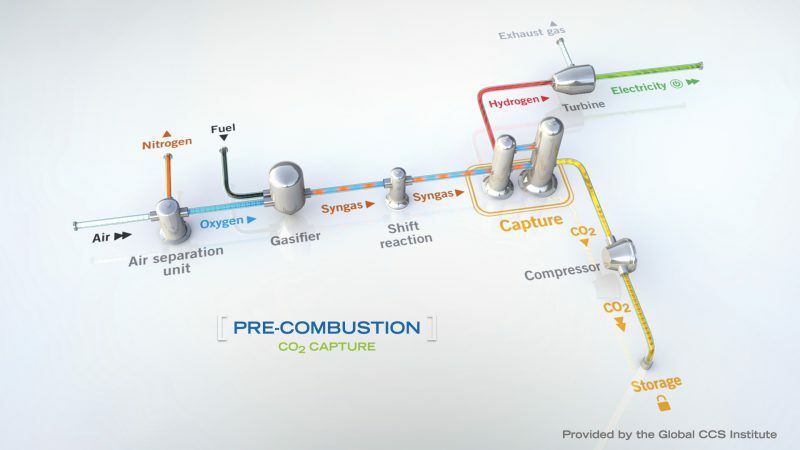 Pre-combustion capture processes convert fuel into a gaseous mixture of hydrogen and CO2. The hydrogen is separated and can be burnt without producing any CO2. The CO2 can then be compressed for transport and storage. The fuel conversion steps required for pre-combustion are more complex than the processes involved in post-combustion, making the technology more difficult to apply to existing power plants. Pre-combustion capture is used in industrial processes (such as natural gas processing) while its application in power generation will be via new build projects. Post-combustion processes separate CO2 from combustion exhaust gases. CO2 can be captured using a liquid solvent or other separation methods. In an absorption-based approach, once absorbed by the solvent, the CO2 is released by heating to form a high purity CO2 stream. This technology is widely used to capture CO2 for use in the food and beverage industry. 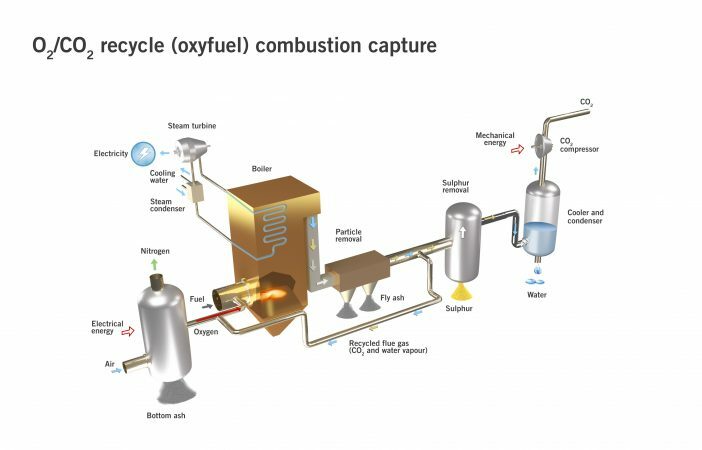 Oxyfuel combustion processes use oxygen rather than air for combustion of fuel. This produces exhaust gas that is mainly water vapour and CO2 that can be easily separated to produce a high purity CO2 stream. Why is reducing CO2 emissions from the power sector critical? Fossil fuel-fired power plants generate a larger percentage of CO2 emissions than any other industry. Therefore, applying carbon capture technology to that sector – whether on new or existing plants – has the potential for the greatest reduction of CO2 emissions compared to other sectors. CO2 capture technologies can be installed into all types of new coal and gas-based power plants. However, CCS represents a significant financial investment; appropriate climate policies and regulations that place a penalty on carbon emissions are required to recover these costs and further CCS deployment. The same is true for retrofitting CCS into existing power plants, which requires space and extensive integration to accommodate the CO2 capture plant. Why is reducing CO2 emissions from the industrial sector critical? Industrial processes such as cement, steel, pulp and paper, chemicals and natural gas processing are significant emitters of CO2, accounting or around 25% of energy-related CO2 emissions. Capture application can be applied in these industries to make a significant reduction in global CO2 emissions. In some cases, CO2 emissions are a by-product of these processes rather than the result of burning fossil fuels in the production process. For some industrial processes (such as cement manufacture and blast furnace steel making) CCS is the only technological option that can help secure deep emissions reduction. Is CO2 currently captured from the industrial sector? Some of the earliest CCS projects are in natural gas processing. For example, the Sleipner CO2 Storage project in Norway, operating since 1996, captures around one million tonnes of CO2 a year. This is then injected into a deep saline formation in the North Sea for permanent storage. Where does carbon capture technology go from here? Carbon capture has been clearly demonstrated at pilot scale and in a number of industrial processes at large-scale for many years. The application of capture technologies to large-scale power projects is now a reality. The technology already works, but more research is required to reduce the cost and energy penalties for the next generation of capture technologies. There is a global need for significant financial investments to bring numerous commercial-scale demonstration projects online in the near future. This portfolio of projects will provide significant ‘learning by doing’ benefits which, along with continuing research, will contribute significantly to a lowering of costs for carbon capture. For user-friendly information about how CCS works, visit CO2degrees.